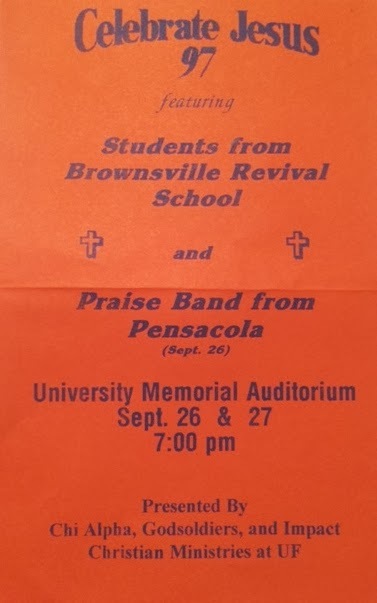 My dad (Sandy Good) was asked by BRSM to lead a school trip to the University of Florida. This trip was sponsored by the local Chi Alpha group in Gainesville, Florida. My dad assembled a team consisting of Jonas Denny, (see pic below) myself and 2 other students. We also were to meet up with a worship team lead by Alvin Miranda. Our time here over this past week has been a gift from God. On the 25th, the night before our departure, we were at Brownsville and Steve Hill called our team up to the front to have the congregation pray for our upcoming trip. I ended up on the floor after Steve and everyone prayed for us. The presence of the Lord was very strong. I got to bed that night at 2:30am and was up again that morning at 6:30am to get ready to leave for our trip. These are revival hours. We drove about 5 hours to the University of Florida and after arriving checked into our hotel rooms. After freshening up we made our way to the University Memorial Auditorium were the event was being held. Before our meeting, we were outside talking with people and inviting them to the service. One man we spoke with was cursing the Bible and suddenly there was a loud bang, like a lighting bolt had just struck right next to us. It scared us all, especially the man who had just been cursing God. He did not have much more to say after that. We never did find out were the sound came from. Our team prayed for about an hour and a half asking the Lord to send his Spirit and to save the lost and backslidden and refresh those who are dry. "17 For God did not send his Son into the world to condemn the world, but to save the world through him. 18 Whoever believes in him is not condemned, but whoever does not believe stands condemned already because they have not believed in the name of God’s one and only Son. 19 This is the verdict: Light has come into the world, but people loved darkness instead of light because their deeds were evil. 20 Everyone who does evil hates the light, and will not come into the light for fear that their deeds will be exposed." I gave an altar call while Alvin played "Lord have Mercy" and about 40 out of the 200 attending responded to the Lord. God is so goodl! We then prayed with those that wanted prayer and the Lord really moved in power. Yesterday, we started our day with reading the word and prayer in preperation for the service that evening. That evening Jonas and a second team members shared, followed by a message that I gave. It was good but it did not feel as free as the previous evening. I spoke on how sin separates us from God. "3 It is God’s will that you should be sanctified: that you should avoid sexual immorality; 4 that each of you should learn to control your own body[a] in a way that is holy and honorable, 5 not in passionate lust like the pagans, who do not know God; 6 and that in this matter no one should wrong or take advantage of a brother or sister. The Lord will punish all those who commit such sins, as we told you and warned you before. 7 For God did not call us to be impure, but to live a holy life. 8 Therefore, anyone who rejects this instruction does not reject a human being but God, the very God who gives you his Holy Spirit." About 25 out of 150 responded to the altar call. God is always faithful. This morning was a little different. We ministered at a local AOG church. It felt as though many of the people there were not hungry for the Lord. God touched the few who were hungry for Him. Overall it was a great trip. Many heard His Word and made a choice to follow the Lord!